Widely used by all EMS services, Police , Search and Rescue for multiple scenarios . Anatomically correct, feels like an unconscious person - suitable for casualty evacuation training in 'hot zones and 'shooter active incidents'. Realistic size and weight - suitable for forensic reconstruction and road traffic collision investigation. 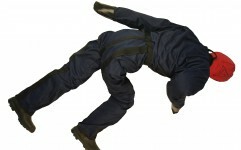 We also offer a shorter adult manikin often preferred by some of our customers in Asia - these are offered at 1.7 metres and 30Kg, 50Kg and 70Kgs. Note: These manikins will withstand temperatures up to 100°C - above this temperature or where 'flash-over' may occur, we recommend using our Fire House training manikin. The Duty model also has normal weighting so should not be used in deep water, for water rescue scenarios we advise that you use one of our Water Rescue manikins which are designed to float appropriately.